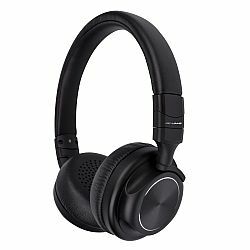 The RevJams Studio LITE Bluetooth headphones offer an on ear design that is comfortable and isolates outside noise, allowing the music to be heard clearly without interference. High quality drivers offer deep bass and crisp treble. Wireless Bluetooth technology offers a range of 33ft from any enabled device, including tablets, smartphones, iPads, iPhones, computers and more. 20 Hours of continuous play time is offered on a single charge. Built in music controls for volume, play/pause and track skip, are easily accessible directly from the headphones, allowing for simple and easy control of your music without a need to reach for your phone or device. Use the built in Microphone and answer button to make and receive phone calls directly from the headphones. RevJams Studio LITE headphones include a charging cable, an audio cable to listen using NON Bluetooth devices.